When it comes to the super premium American Whiskey space, Diageo is in an interesting position. While Bulleit does amazing business for them, it’s contract distilled at Four Roses and MGP, making it difficult to pull old, rare, barrels from the back of the warehouse and release them as a limited editions. Diageo’s George Dickel does produce their own whiskey (and excellent whiskey at that), but the market for super premium American Whiskey seems to be much more interested in bourbon or Kentucky Whiskey than Tennessee Whiskey. It would be an exceptionally difficult position to be in were it not for Diageo’s whiskey stocks, which it has acquired along the way through buying and selling other companies. For the most part, Diageo has stored these whiskeys at the old Stitzel-Weller Distillery, which it now uses to showcase their “Bulleit Experience“. The problem, though, is that these whiskeys come from a variety of sources including distilleries that now produce whiskey for competing brands. So how do you market an old, rare, whiskey from a brand you don’t really own? The answer for Diageo is to create a line of whiskeys where the rareness is the focus and not where they were produced. On many levels Diageo’s Orphan Barrel project has been a huge success. Internally, getting these limited releases out the door at a company so focused on volume and growth has been significant. In the marketplace, these whiskeys have been snatched up (especially Old Blowhard) with the same level of fervor that other rare, super premium whiskeys have seen. The biggest problem with the Orphan Barrel line is that most of the whiskeys released to date have been too old. Depending on its mash bill and where it was aged, most bourbon loses its balance and gives way to the barrel somewhere between the 9 and 12 year mark. Because where a barrel is aged can have a significant impact on the aging process, some barrels of bourbon continue to age gracefully, even though they technically should have begun their descent. Most consumers aren’t aware that American whiskey passes its prime so early, much earlier than their Scotch Whisky counterparts, whose prime age really begins as American Whiskey’s ends (in the 10-12 year space). To date, most of the releases in the Orphan Barrel line have been consistently over-oaked, a symptom of the victory of the barrel over the core whiskey that’s aged inside it. Consumers seem to be okay with this fact, overlooking balance issues in favor of the satisfaction of owning and consuming something old and rare. Lost Prophet 22 Year Old Kentucky Straight Bourbon Whiskey (45.05% / 90.1 proof, $120) – the latest installment in the Orphan Barrel series was distilled in 1991 in Frankfort, Ky at the old George T. Stagg Distillery and then further aged in the Stitzel-Weller Warehouses in Louisville, Ky. Dark gold in color, as you’d expect the nose on the Lost Prophet leads with strong oak. Here it’s a sharp, varnishy note that isn’t very inviting. The oak is accompanied by leather and cinnamon with a hint of caramel and coconut underneath. The entry is a lot more pleasant, affable, and balanced than the nose as it leads with a well integrated combination of oak, cinnamon, and caramel. The mouthfeel helps enhance this whiskey’s affability – it’s soft and round without being overly heavy. Even with an increase of oak and the addition of clove, cinnamon, and leather, the midpalate maintains Lost Prophet’s accessible and affable character. Under the spice in the midpalate is the caramel from the opening along with a touch of coconut and dried apricot. It’s not really until the end of the midpalate where the age of this bourbon really shows itself and things transition from soft and slightly sweet to tannic and very dry. Like the nose, the finish for Lost Prophet isn’t very pleasant or inviting. While oak kicks off the finish, it’s actually much shorter of a finish from a flavor perspective than we’d expect. Instead, Lost Prophet ends tannic and puckeringly dry. It’s hard to penalize a 22 year old whiskey for being old, as there are simply aspects of the taste experience that you’re going to have to accept if you buy this kind of whiskey. 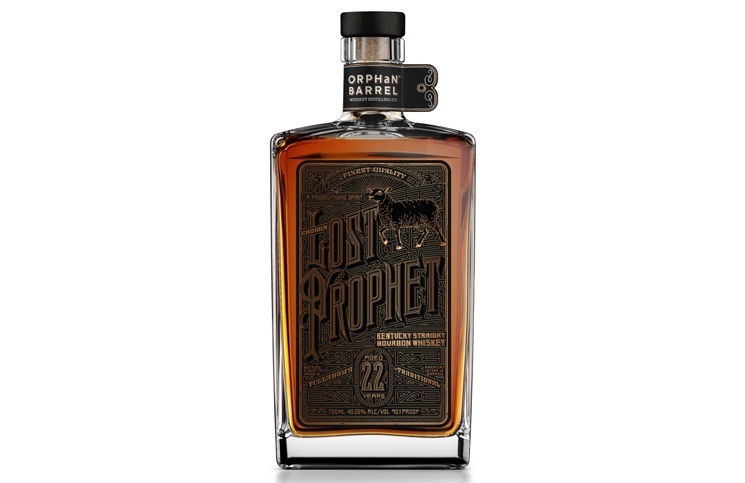 Of the releases in the Orphan Barrel series, Lost Prophet does the best job of mitigating some of those qualities. It’s easier to overlook an abrasive nose and puckering finish when the core of the whiskey is so enjoyable. 90 points. It's hard to penalize a 22 year old whiskey for being old, as there are simply aspects of the taste experience that you're going to have to accept if you buy this kind of whiskey. Of the releases in the Orphan Barrel series, Lost Prophet does the best job of mitigating some of those qualities. It's easier to overlook an abrasive nose and puckering finish when the core of the whiskey is so enjoyable.